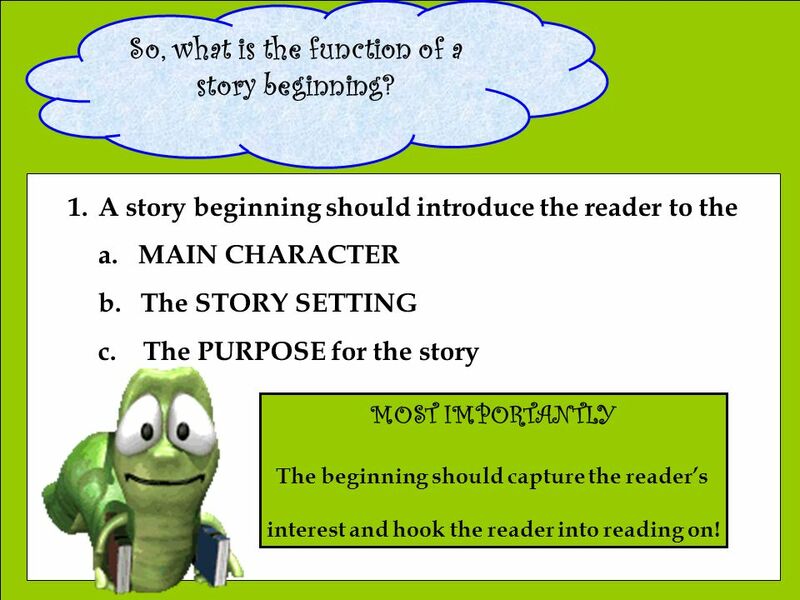 Entertaining Beginning The beginning must “hook” the reader and make them feel compelled to read on. 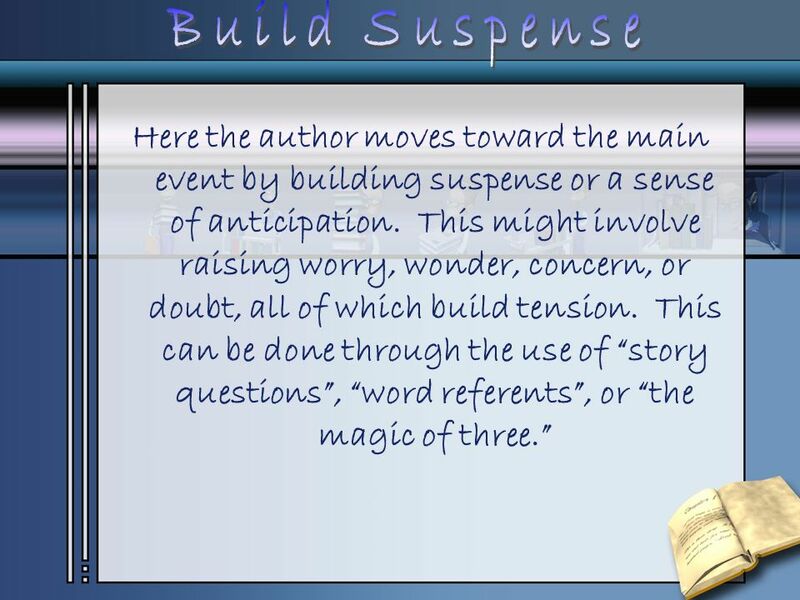 The author might use an interesting action, dialogue or exclamation, the main character’s thoughts, or feelings, raise story questions or even use a sound to grab the reader’s attention. Stories should begin as close to the main event as possible. 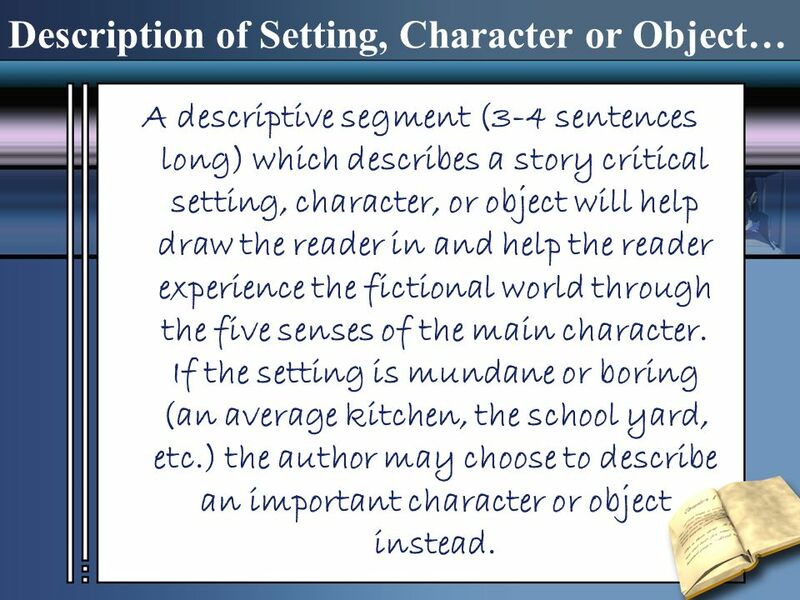 A descriptive segment (3-4 sentences long) which describes a story critical setting, character, or object will help draw the reader in and help the reader experience the fictional world through the five senses of the main character. If the setting is mundane or boring (an average kitchen, the school yard, etc.) the author may choose to describe an important character or object instead. 6 THE MAIN EVENT This is the most important part of the story – the climax, the event that the entire story has led up to – essentially, what the whole story is about. 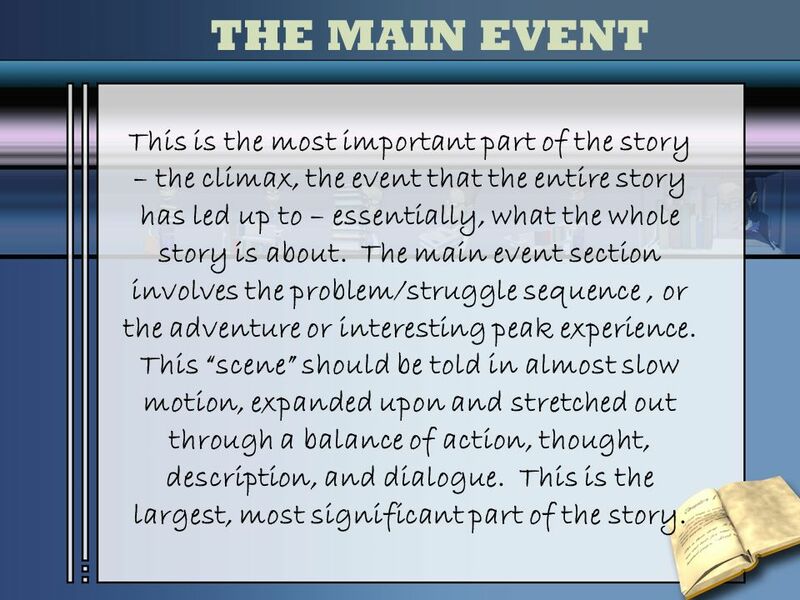 The main event section involves the problem/struggle sequence , or the adventure or interesting peak experience. This “scene” should be told in almost slow motion, expanded upon and stretched out through a balance of action, thought, description, and dialogue. This is the largest, most significant part of the story. This is the section that brings the main event to a close. The problem is solved or the adventure or experience comes to an end. 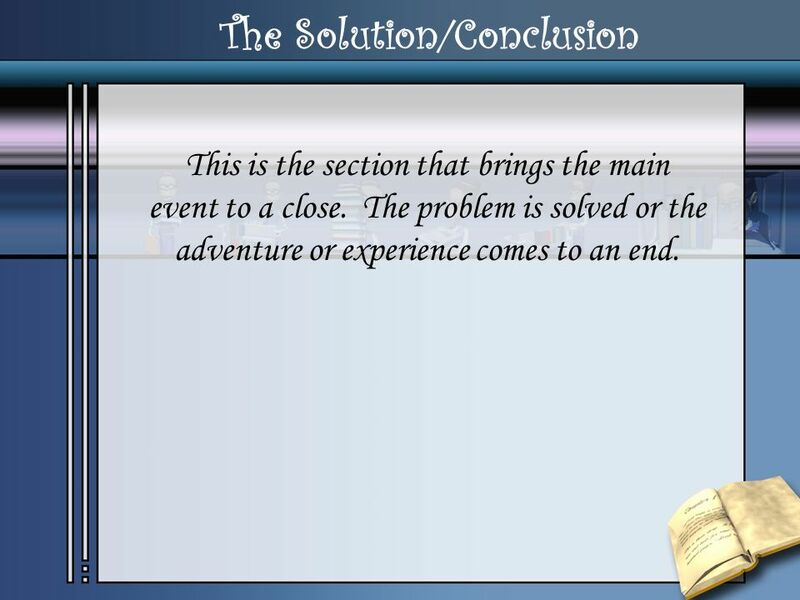 8 Extended Ending The ending summarizes the main character’s thoughts, feelings, memories, hopes, wishes or decisions in regard to the main event. It might also include a defining action that SHOWS any of above. 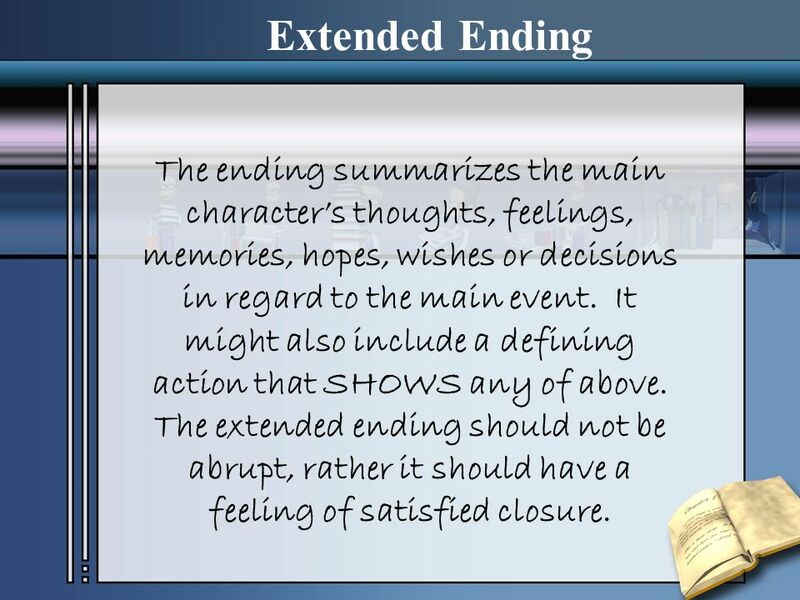 The extended ending should not be abrupt, rather it should have a feeling of satisfied closure. 10 Hi there kids, my name is Bradley and I am here to tell you what makes me want to read a book, story, or essay. 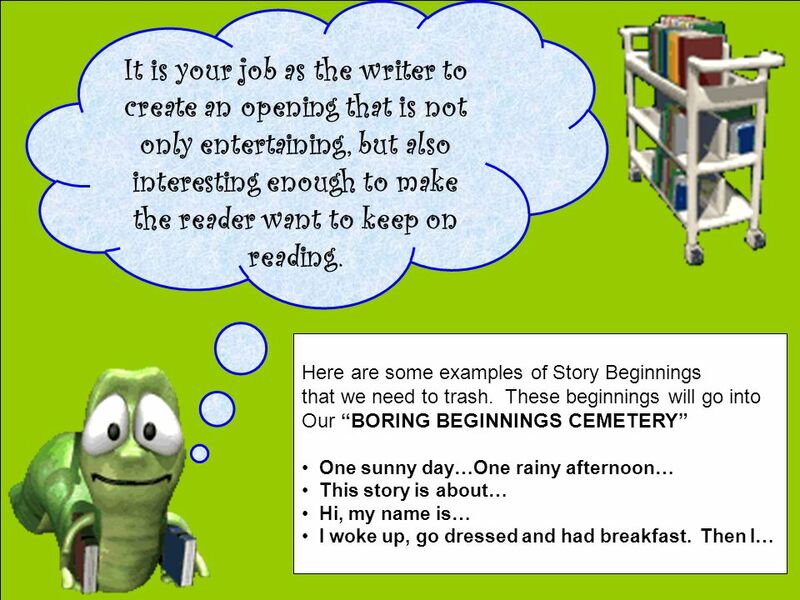 Did you know that the beginning of a story, just like a first impression, is very important! 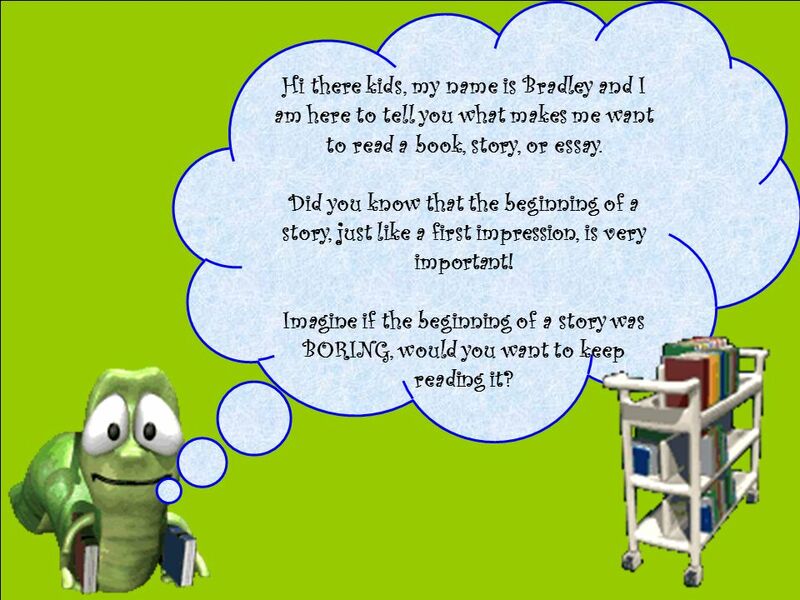 Imagine if the beginning of a story was BORING, would you want to keep reading it? 12 Let’s see, can you tell me what is wrong with these openings? 13 What did you and your team come up with? What’s the problem with these? 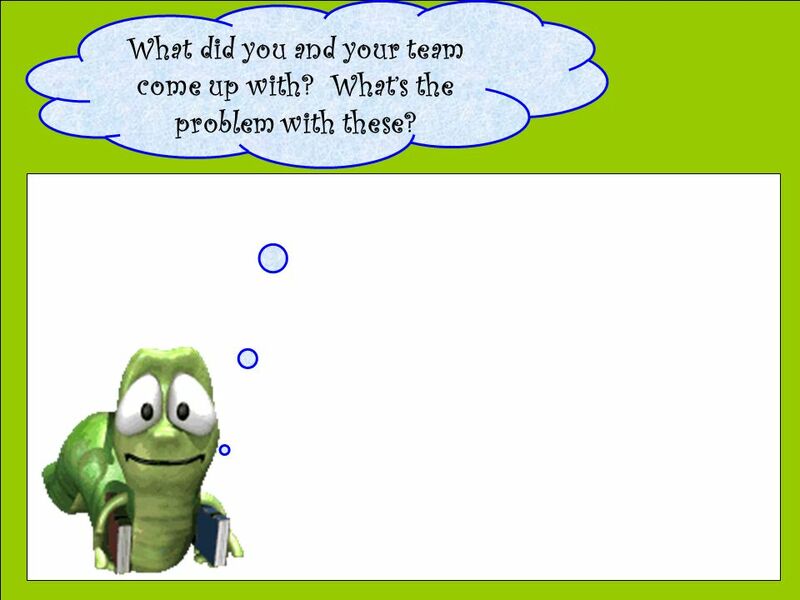 14 What did you and your team come up with? What’s the problem with these? 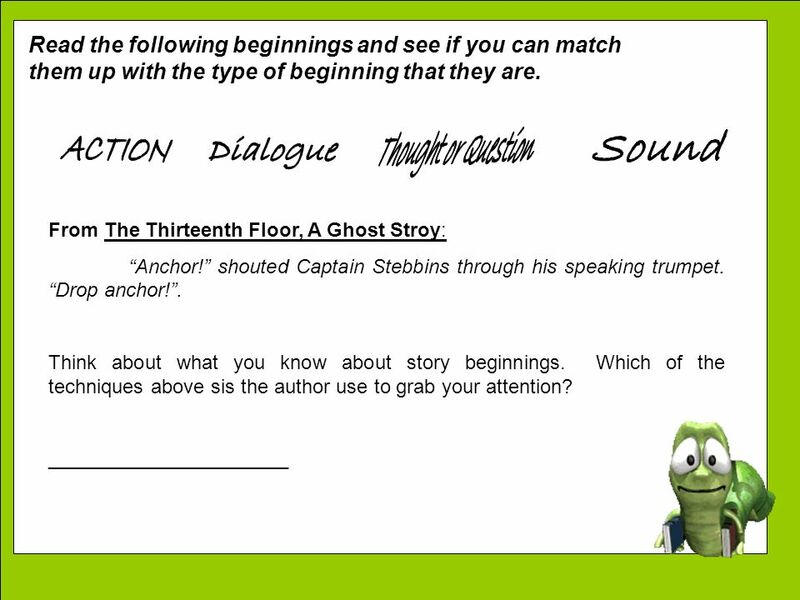 15 BORING BORING BORING So, what is the function of a story beginning? 16 THE STORY SHOULD BEGIN AS CLOSE TO THE MAIN EVENT AS POSSIBLE!!! RIIIIINNNNNNGGGGG! “Oh no the bell is ringing,” I said to Heidi as we ran towards our classroom. First day of school and I am already late. This is the start of a wonderful day, I can’t even imagine what could go wrong next. I arrived breathless from running to get to my math class. This is shaping up to be what seems like the worst day ever, has that ever happened to you? This is a story about how I found a fairy in the woods. TRY THIS: * I walked along the shady forest path on a magical afternoon. 19 An Action…. Put the main character in the setting doing something interesting and relevant RIIIIINNNNNNGGGGG! 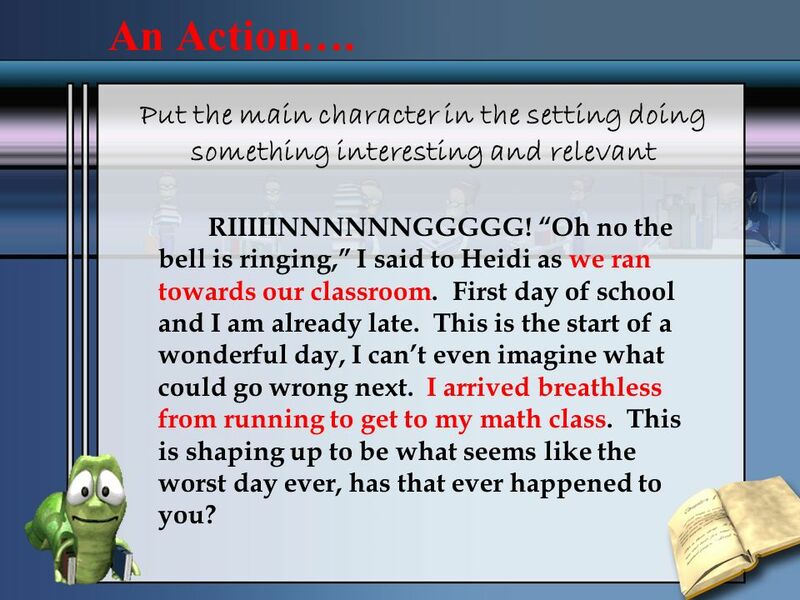 “Oh no the bell is ringing,” I said to Heidi as we ran towards our classroom. First day of school and I am already late. This is the start of a wonderful day, I can’t even imagine what could go wrong next. I arrived breathless from running to get to my math class. This is shaping up to be what seems like the worst day ever, has that ever happened to you? This is a story about how I found a fairy in the woods. TRY THIS: * “What a magical day for a walk in the woods!” I said. 21 DIALOGUE… Have the main character say something that expresses a feeling, creates worry, or raises the reader’s interest or curiosity. It could be an EXCLAMATION! RIIIIINNNNNNGGGGG! 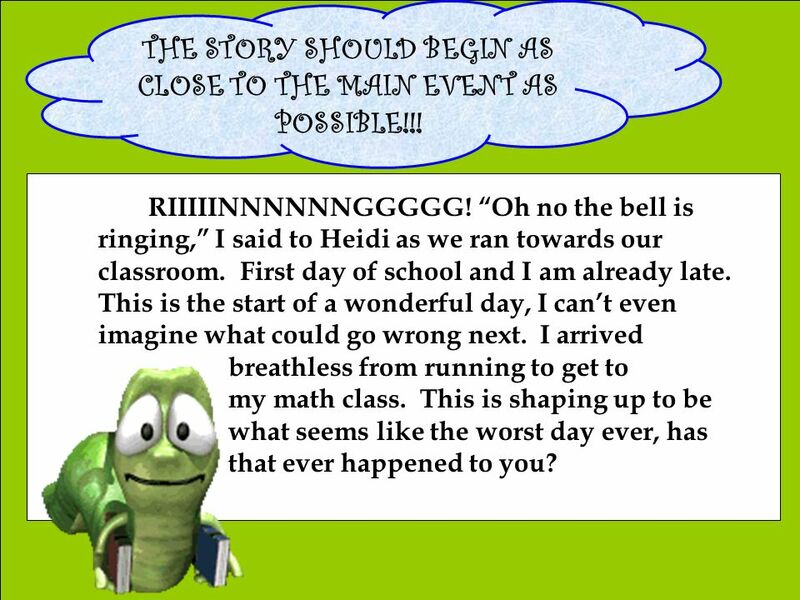 “Oh no the bell is ringing!” I said to Heidi as we ran towards our classroom. First day of school and I am already late. This is the start of a wonderful day, I can’t even imagine what could go wrong next. I arrived breathless from running to get to my math class. This is shaping up to be what seems like the worst day ever, has that ever happened to you? THOUGHT/QUESTION: What are you thinking, wondering or worrying? Instead of: This is a story about how I found a fairy in the woods. 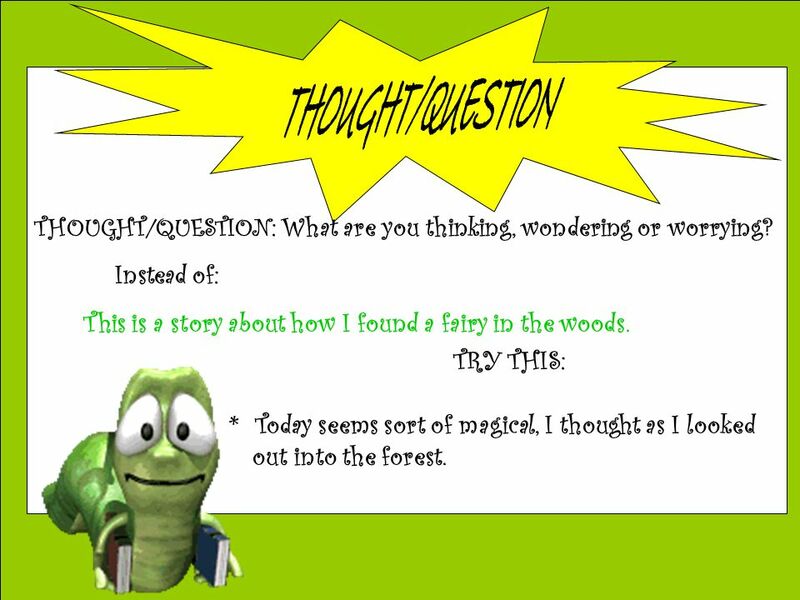 TRY THIS: * Today seems sort of magical, I thought as I looked out into the forest. 23 Show what the main character is thinking or worrying about. A THOUGHT/QUESTION… Show what the main character is thinking or worrying about. RIIIIINNNNNNGGGGG! “Oh no the bell is ringing!” I said to Heidi as we ran towards our classroom. First day of school and I am already late. This is the start of a wonderful day, I can’t even imagine what could go wrong next. I arrived breathless from running to get to my math class. This is shaping up to be what seems like the worst day ever, has that ever happened to you? 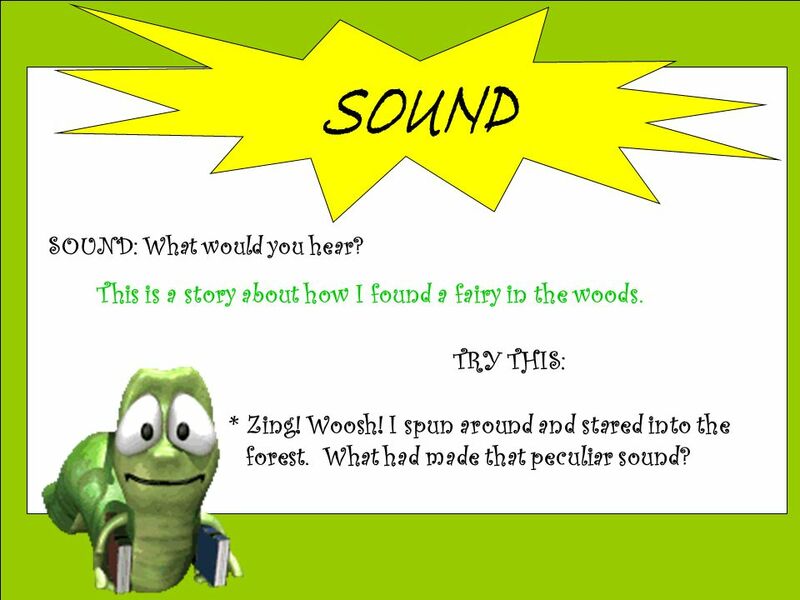 24 SOUND This is a story about how I found a fairy in the woods. SOUND: What would you hear? This is a story about how I found a fairy in the woods. TRY THIS: * Zing! Woosh! I spun around and stared into the forest. What had made that peculiar sound? 25 SOUND… A story-relevant sound effect or a description of a sound is a great attention getting technique. RIIIIINNNNNNGGGGG! “Oh no the bell is ringing!” I said to Heidi as we ran towards our classroom. First day of school and I am already late. This is the start of a wonderful day, I can’t even imagine what could go wrong next. I arrived breathless from running to get to my math class. This is shaping up to be what seems like the worst day ever, has that ever happened to you? 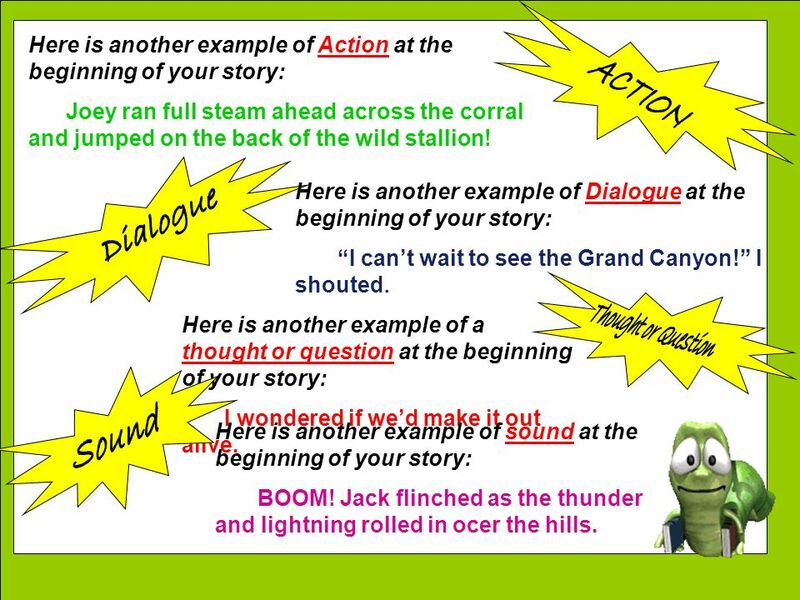 Here is another example of Action at the beginning of your story: Joey ran full steam ahead across the corral and jumped on the back of the wild stallion! ACTION Here is another example of Dialogue at the beginning of your story: “I can’t wait to see the Grand Canyon!” I shouted. Dialogue Thought or Question Here is another example of a thought or question at the beginning of your story: I wondered if we’d make it out alive. 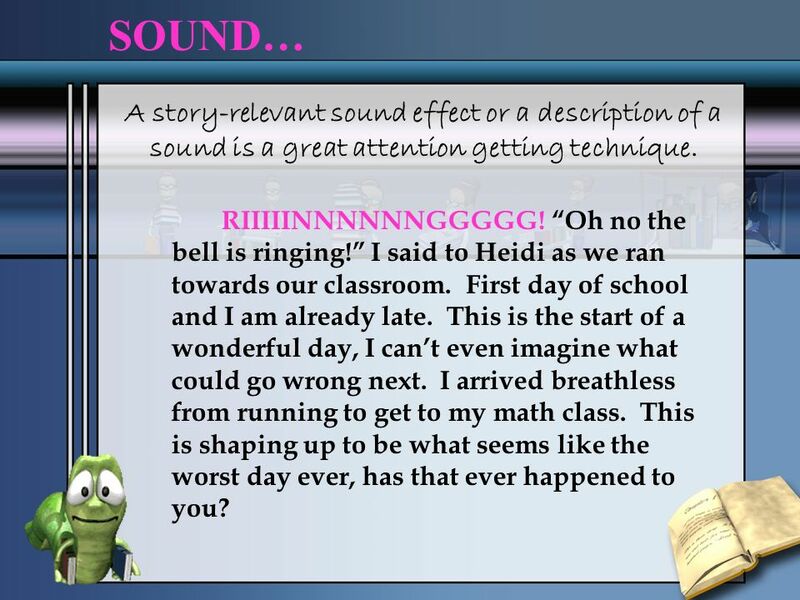 Sound Here is another example of sound at the beginning of your story: BOOM! Jack flinched as the thunder and lightning rolled in ocer the hills. Hi, my name is Kate. I will tell you about my adventure exploring a haunted house! Is this an attention grabbing beginning? We are going to revise this story beginning so that it is interesting and entertaining. We will use one of the four techniques listed below. We will NOT write the whole story, just the beginning. Action: What would you do? 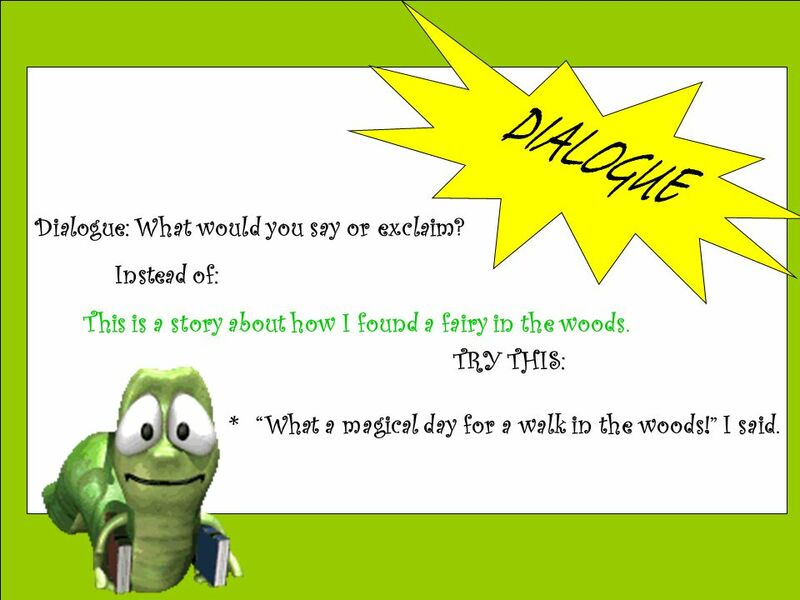 Dialogue or Exclamation: What would you say? Thought or Question: What are you wondering or worrying about? Sound: What would you hear? Hi, my name is Kate. 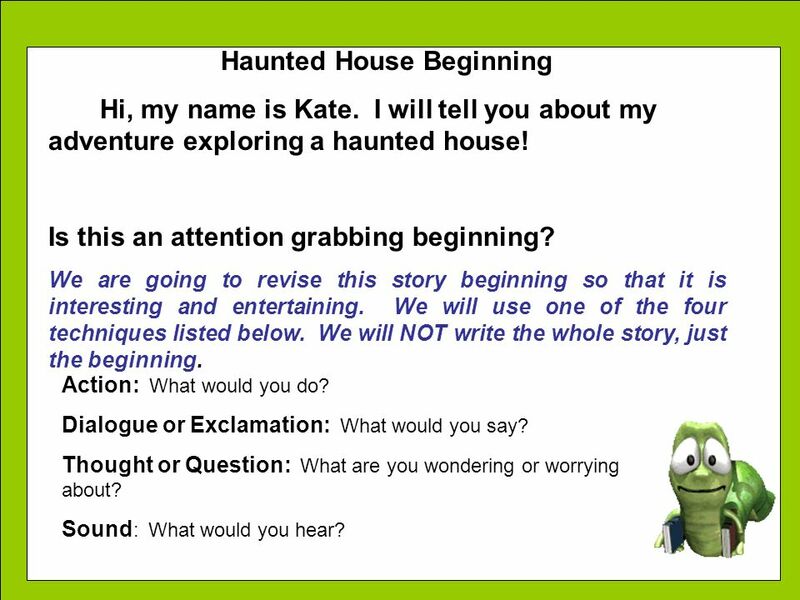 I will tell you about my adventure exploring a haunted house! 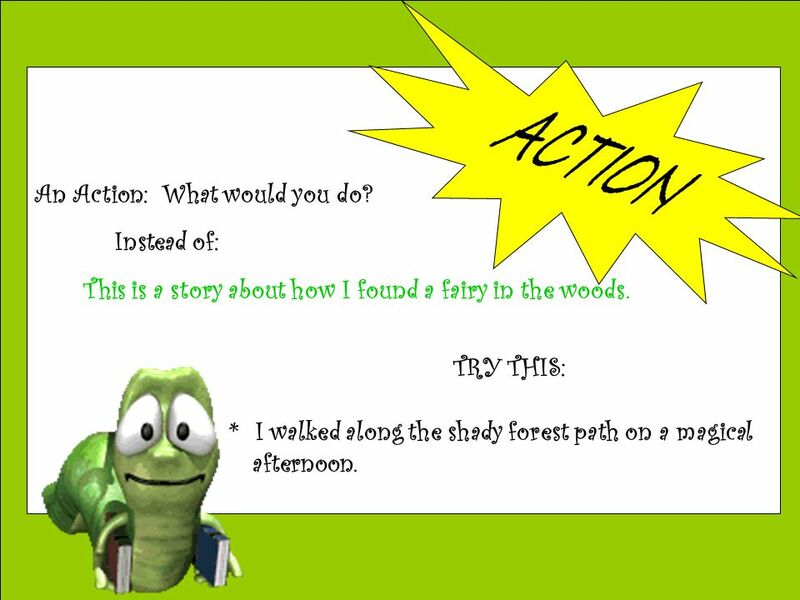 Here are some examples for this story: Action: What would you do? My hands trembled as I opened the creaky old door of the deserted house. 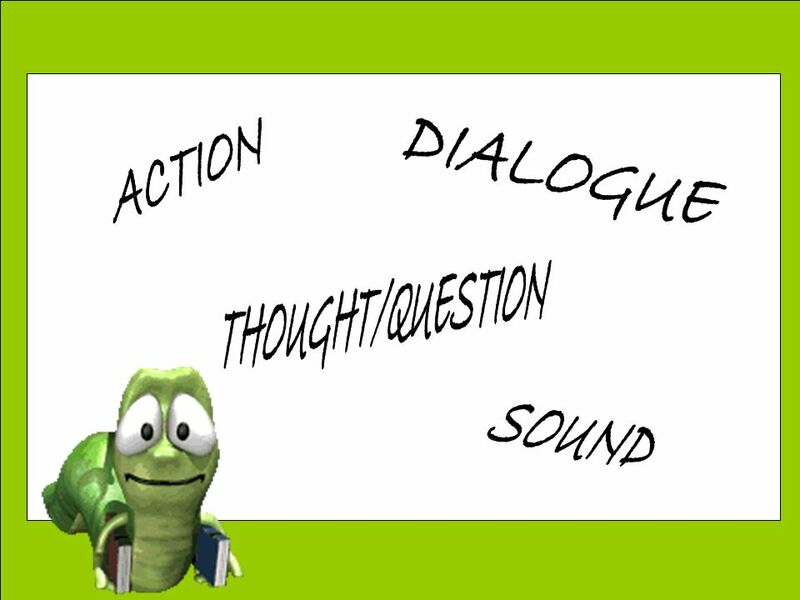 Dialogue or Exclamation: What would you say? “Here goes nothing!” I said as I climbed through the window of the old haunted house. Thought or Question: What are you wondering or worrying about? I hope this place isn’t really haunted, I thought, as I tiptoed inside. Sound: What would you hear? Boo! Hiss! I shuddered at the strange noises coming from the basement of the abandoned house. Hi, my name is Kate. I will tell you about my adventure exploring a haunted house! Action: What would you do? Hi, my name is Kate. I will tell you about my adventure exploring a haunted house! 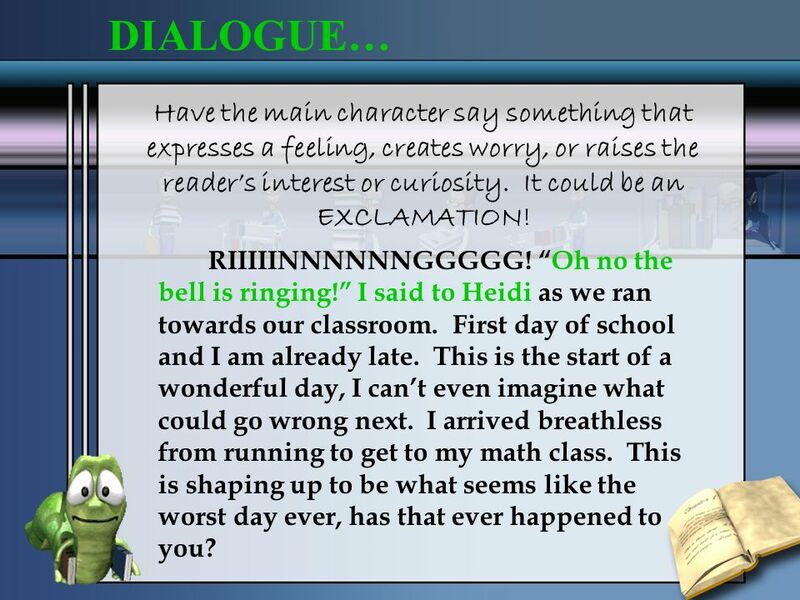 Dialogue or Exclamation: What would you say? Hi, my name is Kate. I will tell you about my adventure exploring a haunted house! Sound: What would you hear? Hi, my name is Kate. I will tell you about my adventure exploring a haunted house! Thought or Question: What are you wondering or worrying about? What would my Mum think? thought Chris. Of course shed be worried but also extremely angry if she found out what hed been up to. He knew he shouldnt be. Character/Problem Solution Focus on Character: Main character struggles, grows, and changes Purpose: to entertain an audience of others Personal Experience. 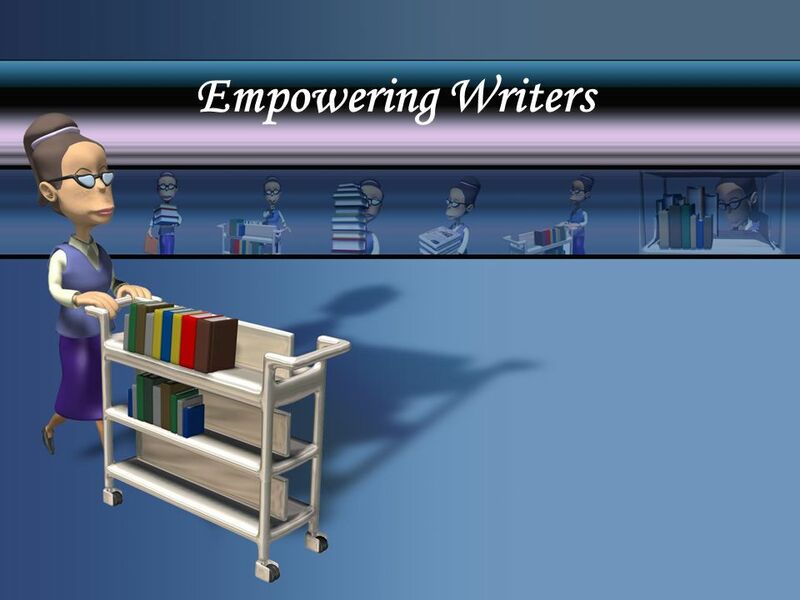 Higher Writing Portfolio Reflective Writing. The information in this power point presentation is based on the information from the textbook: Intermediate. A Personal Memoir Grade 8 English. 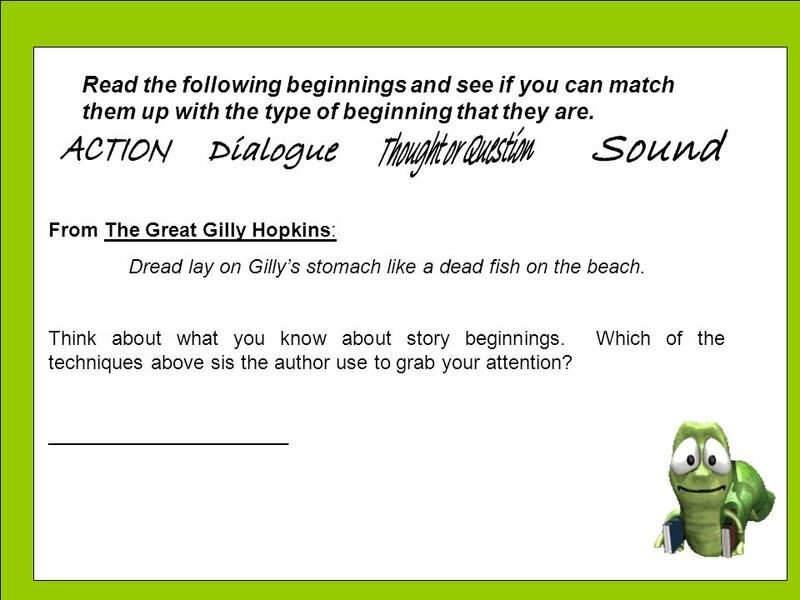 A Graphic Organizer Opening Sentence Something about feeling tired, looking forward to a relaxing evening on the couch. 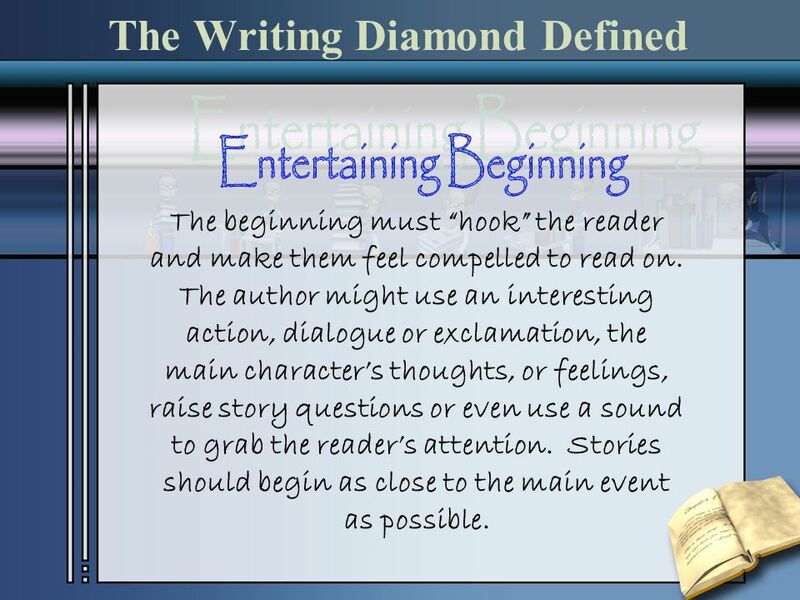 How to write beginnings to capture your reader’s attention! Entry Level English: Creating Narratives Horror Romance Science Fiction Action/Adventure Crime/Detective Castle Laboratory Dark woods The Moon Restaurant. 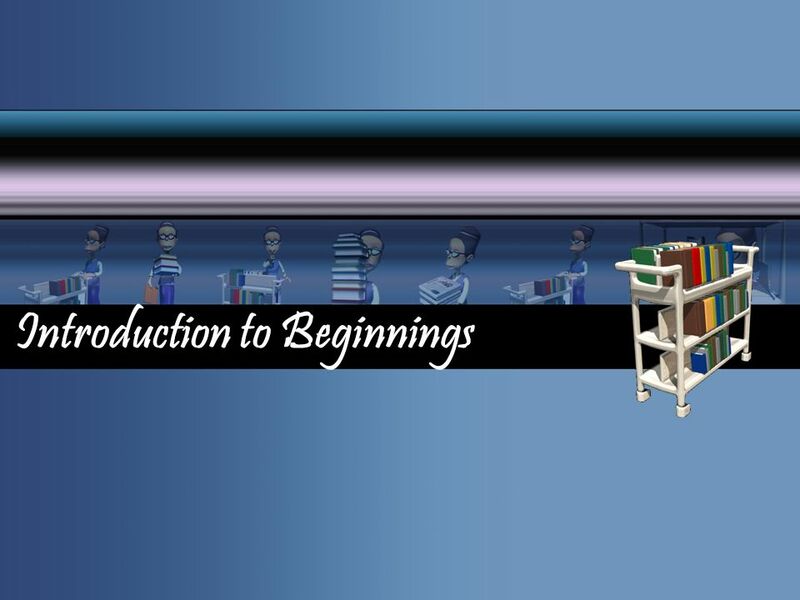 Beyond the Setup and Summary: How to Write Effective Introductions and Conclusions Prepared by Jessica Gordon for UNIV200: Inquiry and The Craft of Argument. AUTOBIOGRAPHICAL INCIDENT WRITING ABOUT YOUR FAVORITE PERSON – YOU! The Confident Writer Chapter 8: Narrating and Describing. PAPER 1 PRACTICE STRUCTURE FOR EFFECT. 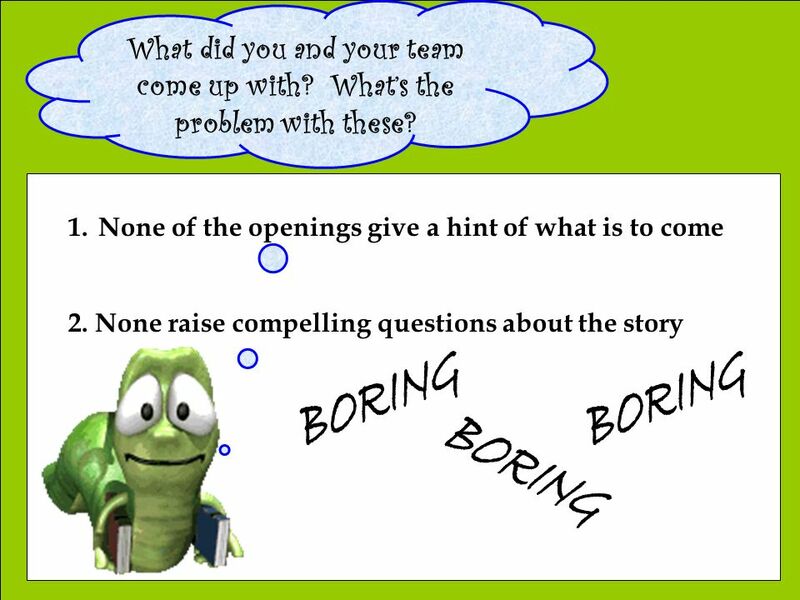 LESSON OBJECTIVES I MUST: understand the function of openings and endings I SHOULD: identify features contained. Narratives What’s in a story?. 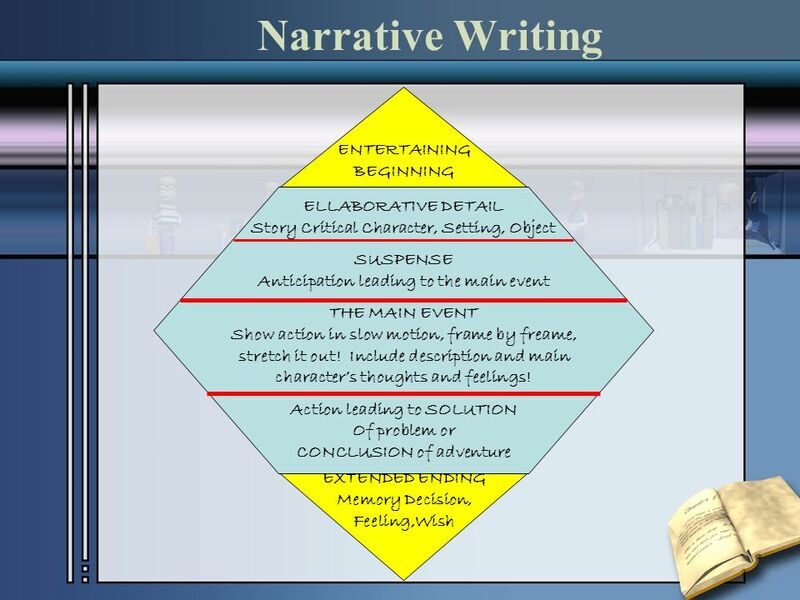 What is a narrative? 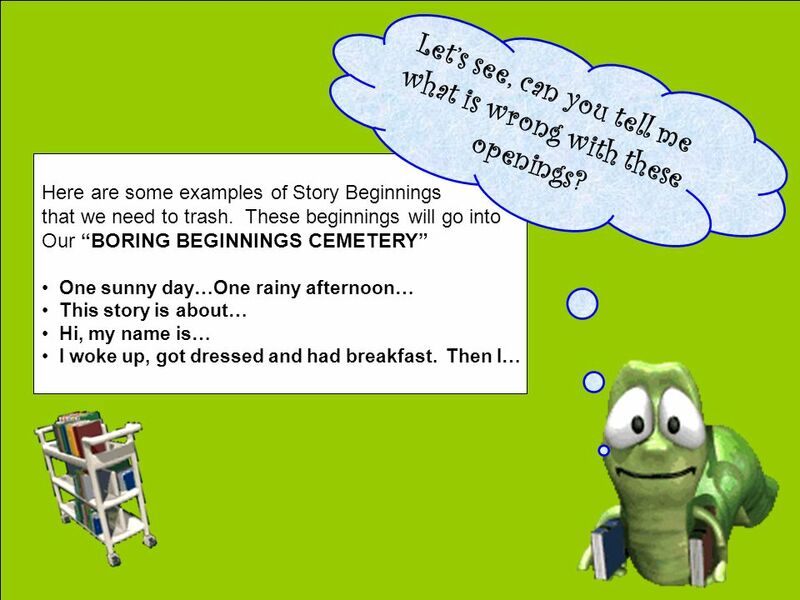 A narrative is a story that is usually used to entertain, motivate or teach. It aims to get attention. Mrs. Murray's 4th Grade eMINTS Classroom. Vocabulary/Word Work: Homophones Homophones, or homonyms, are words that are pronounced the same but have different. 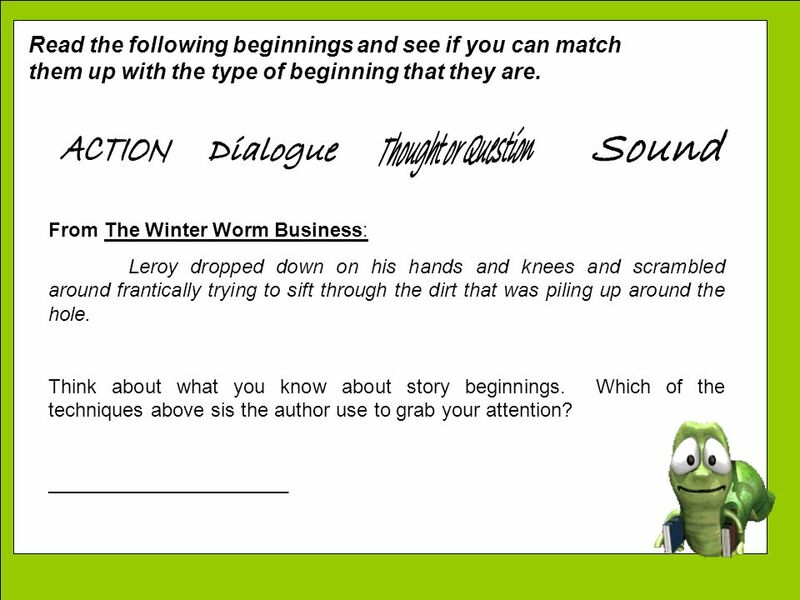 This I Believe Essay Writer’s Workshop: Introductions, Juicy Details, & Conclusions 8 th ELA St. Joseph School.